The national flag carrier of the Netherlands, serving 165 destinations worldwide via Amsterdam Airport Schiphol. We hope to see you on board soon! We're happy to announce that we've added Guanacaste Liberia to our network as new destination! Get ready for these exciting spring destinations! Two TripAdvisor Awards in the pocket! 🏆 Best Business Class Europe and Major Airline Europe.🏆Thanks to all of you! Hey, got a minute? 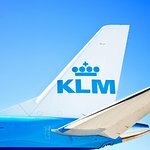 Do you have a burning KLM related question that makes you think, 'What The FAQ'? Leave your question on our social channels and we might answer it! In this second episode, our pilot Christa tells you everything you want to know about physical requirements to be a pilot. GO! What is it like...to be a pilot? 👩‍✈️👨‍✈️Intern Marta joined our pilots Richard and Christa in the cockpit!